In the past, when we headed to the amusement park, the zoo, or other attractions, one thing that we always wondered about was the security of leaving our stroller parked at the entrance to a ride or exhibit. Sure, there were others doing the same thing, but what was preventing someone from taking our stroller. In general, I always trust in the general good of people, but my husband always still says you can never be sure. That is why I was very intrigued when I was contacted about reviewing the BuggyGuard Retractable Stroller Lock. 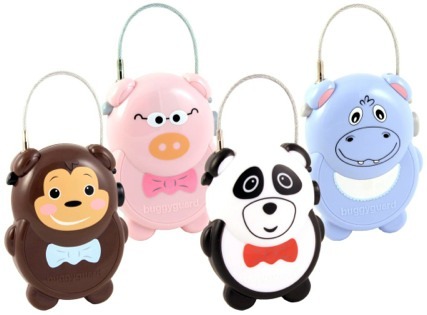 These locks come in the form of four adorable animals - a hippo, a pig, a panda and a monkey. They include a bracket that allows you to attach it to the frame of the stroller. When the lock is in the locked position, the bracket can not be removed. To use the lock, simply push on the cable trigger button and pull out the cable, which is 4' long. 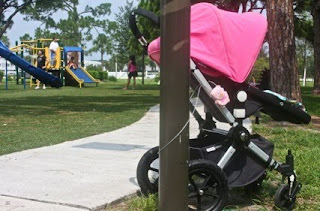 Secure the cable around the stroller and a stationary object (or if there isn't one nearby, simply run the cable through two or more tires) and put the cable head into the locking port, learn more about how to lock here. Turn the dial to scramble the numbers. When you are done, enter your combination on the dial. Press the release button to release the cable head and then push the cable trigger button to retract the cable back into the lock. The locks come preset from the factory, but are very easy to set with your own three digit combination. When your children are bigger and you use the stroller less often, these locks could also work for your child's bike. The three digit combination would be easy for them to remember, and the cute animal would be appealing to them. Of course, I can tell you that my son, who is 7 likely would no longer find the cute animal attached to his bike to be "cool", but my daughter would love to have it attached to her bike. In addition to the BuggyGuard retractable stroller lock, the company also offers a B-Hook. This hook offers an easy way to hang your purse, your shopping bags, your camera bag, or other bags from the handle of your stroller or shopping cart, freeing you to focus on your children. They come with an optional lock that allows you to lock those items in place. Now certainly, the hook provides only minimal security, in that you can still access the contents of your bags, but at least you don't have to worry about holding all those bags while you are pushing your stroller through the mall, at the zoo, down the street or elsewhere. I will caution you to remember that hanging too much on the back of the stroller could cause it to be unstable and if you take your child out before removing the bags, your stroller very likely will tip over. I think this hook is very convenient when grocery shopping, as well. When I head to the grocery store, I always put my reusable bags in the cart. Unfortunately, by the time I am done shopping, they are buried, with my purse, under all of my groceries. With this hook, I can attach it to the side of the cart and hang the empty reusable bags from the hook. Then, when I get to check out, the bags are accessible on the side of my cart and not buried under the groceries. 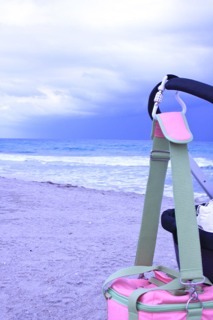 You can purchase BuggyGuard and B Hook through Online and US Retailers. Find a store near you here, or find an online store. The BuggyGuard retails for about $24.95 and the B Hook for about $11.95. Courtesy of BuggyGuard, I have the opportunity to provide a giveaway to 4 (four) A Busy Mom of Two readers. 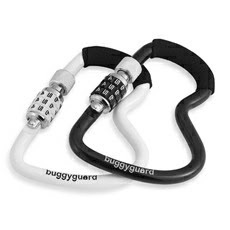 Two readers will win a BuggyGuard Lock and two readers will win a B Hook. To enter: Leave a comment sharing which BuggyGuard animal shape is your favorite and whether this would be for you or a gift. Follow A Busy Mom of Two and follow BuggyGuard on Twitter. This can be done once daily, please be sure to leave a link to the tweet in your comment. Share this giveaway with your friends on Facebook. Leave a comment letting me know you shared. Giveaway will remain open until September 28th at 6 pm and is open to residents of US only. Winners will be selected using Random.org random number generator. The first two numbers drawn will win the BuggyGuard and the next two will win the B Hook. The winners will be contacted by e-mail (Please make sure that your email address is either in your comment or clearly visible on your profile or blog) and will have 48 hours to respond or a new winner may be selected. No compensation was received for this post. BuggyGuard provided to me for review a BuggyGuard Retractable Stroller Lock and a B Hook. In addition, they are providing two of each for a giveaway. I'd like the pig! He's wearing glasses...how cute! Panda is my favorite. I LOVE the idea of using the clip for the reusable bag, that is great. Always at Kroger, my bags are getting squished under all my groceries! The animal locks are so cute though, great idea!! You're on my bloglines (and forgot to say it would probably be for me in my previous comment, we're almost out of the stroller phase but not quite yet). A little monkey for our Little Monkey! I like the monkey best! I like the pig. I'm hoping to find out soon if I'll be needing one for me... if not, I have a baby shower for a cousin to attend soon. I like the monkey shape and this would be a gift for me. I will soon be buying a new stroller! Hopefully --- fingers crossed! The monkey is definitely my favorite. The pig is really cute too. I Liked BuggyGuard on Facebook. I followed A Busy Mom of Two and follow BuggyGuard on Twitter. I would go for Panda and it would be for us :) Thanks for the giveaway. I like the monkey and I think we would keep this for ourselves. I would defintely get the monkey because we just had our second little girl and we ordered a Bumbleride Indie Twin and I will need a BuggyGuard to protect it. I follow A Busy Mom of Two on twitter. I "liked BuggyGuard on FB. I like the bear and hippo, and it would be a gift. My favorite animal shape is the monkey and it would be for me! i would like the brown bear- its super cute and i would use it for my double stroller when we go to the park- which is about every day. I love the monkey and I would keep this for myself! I like buggyguard on FB! I love the pig shape! I like the panda. It would be for my own Phil & Ted. I love the monkey and we would be keeping it for ourselves! I like the hippo best! We finally have a stroller both of us love using and I'd hate to have it get stolen! Following you and BuggyGaurd on twitter! The panda is my favorite. If I won I would keep it for myself. I like the monkey! I would give it to my brother- they had a new baby girl and did a jungle theme! My kids love monkeys so I would love it for the stroller when I drop my daughter of at preschool. It's pretty hard to fit a double stroller through those doors. I LOVE the panda!! It would be for me :) well, my son really!